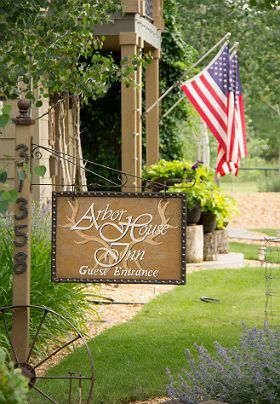 The intimate, five-bedroom property of Arbor House Inn Bed & Breakfast on the River in South Fork, CO is beautifully situated in a narrow mountain valley on three acres of landscaped lawn, natural pasture, and numerous aspen, spruce, and cottonwood trees. The property is bounded on the east and west sides by magnificent, steep stone cliffs. Up and down valley are wide-open views of forested mountains, Colorado blue sky, and the South Fork of the Rio Grande runs through it all. Guests can enjoy the river “up close and personal’ in several bank-side sitting areas. “Camp Calvin,” a secluded spot at the very end of the property, is quietly hidden by stands of river willows and mounds of purple catmint bushes. Adirondack chairs, wooden picnic tables, grill, and an in-ground fire pit give the feeling of a camping getaway. Also on the backyard grounds, just steps up from the river, is a vine-covered log arbor with romantic twinkle lights, furnished with a cozy dining table, comfortable Adirondack chairs, and a copper fire pit. Light up the surrounding tiki torches at night, and it is pure romance. 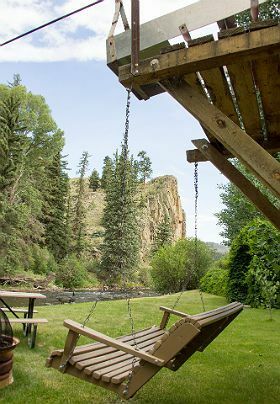 A couple of porch swings for two–one hanging under a rustic river trolley and one tucked under an old spruce tree–have quietly lulled a guest or two to sleep over the years. Z-z-z-z-z. They also double as great seats for watching the local wildlife, the fish, or the fly fishermen trying to catch the fish. Guests are welcome to cast a line in the private river waters here at the inn—catch and release. Everyone’s happy, especially the fish. A croquet set and horseshoe pits are also available. Truly one of the best spots for enjoying the outdoors in general is the canopied hot tub at the corner of the back deck—perfect for a late-night soak under the stars or an early-morning, wake-up dip. Indoors at Arbor House Inn Bed & Breakfast on the River, a large common area features a fireplace, comfortable leather seating, satellite TV, puzzle/game table, and a selection of DVDs to enjoy in the guestrooms. High-speed Wi-Fi is available in the common area, guestrooms, and certain ranges outdoors. Breakfast is served daily in the dining room in the morning, and light refreshments are available on the buffet in the afternoon and evening. Breakfast at Arbor House Inn Bed & Breakfast on the River is one of our favorite times of day. 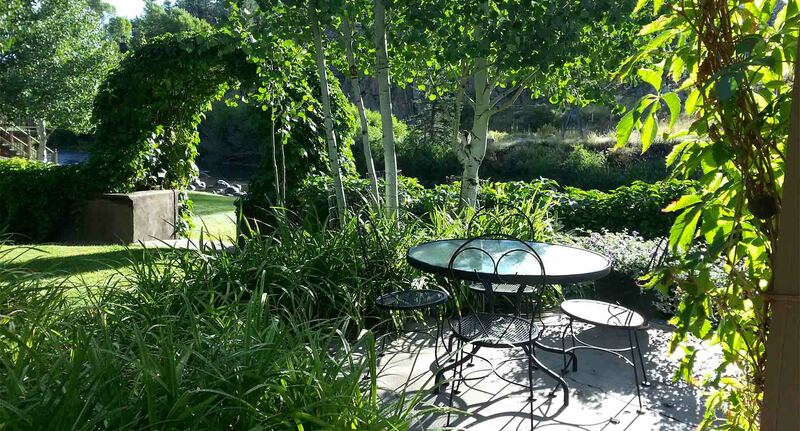 Most days of the year we serve in the dining room with fantastic views of the great outdoors; but in our warmer months, we love to serve al fresco on the back deck so guests can experience the beauty and freshness of riverside dining in the mountains. Accompaniments may feature savory sausages, crispy bacon strips, slices of smoky ham, farm fresh eggs from our own Arbor House chickens, seasonal fresh fruits, variety juices, freshly baked breads and steaming cups of coffee or tea. We take a quick survey of all our guests’ preferences the night before and try to schedule a serving time convenient to most for the following morning—usually between 8:00-8:30, sometimes later on the weekends. Guests who must leave before the scheduled serving time can request a breakfast-to-go bag and to-go cups for coffee that can be brewed and enjoyed in the guestroom or on the run. For guests that prefer to sleep in and skip breakfast altogether, we just ask that you notify us the night before so we can set up accordingly. Please call ahead to alert us of any special dietary requirements we might need to consider in planning and preparing your breakfast items. This was our first time at a bed & breakfast. The room was absolutely breathtaking! We enjoyed being able to sit in the hot tub under a full moon. I don’t know what was more romantic—the hot tub under a full moon or the candlelight tub for two. We enjoyed everything—don’t want to go home! Thank you both for the wonderful experience.